Private George Gale's obituary notice in the Grantham Journal of the 2nd June, 1917. George Henry Gale was the oldest son of Goodsir Gale and Rebecca Gale nee Flowers. His father was born in 1865 at Muston, his mother in 1892 at Marston, Lincs. George Henry was born on the 19th February, 1893, at Normanton in the Vale, and baptised on the 19th March that year at Bottesford. In the 1901 census, he was with his parents at Ab Kettleby, together with his younger siblings William Frederick (b.1894), Arthur (b.1895) and Hilda Jane (b.1888). Later, in the census of 1911, he was recorded working as a waggoner on the farm of George Armstrong at Rushton, Northants. George Gale attested in Leicester, aged 22, a “limestone labourer”. 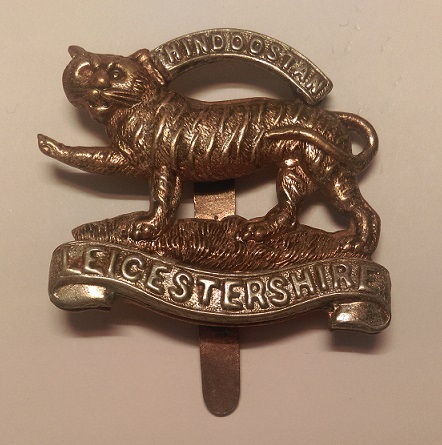 He was ‘approved’ on the 27th January 1916 and posted to the 2/4th Battalion Leicestershire Regiment, initially as 24779 Private. His service number was changed to 202036, which is the number used on his subsequent records. He arrived in France on the 25th February 1917, but on the 11th April, 1917, he fell on the battlefield and was classed as Killed in Action. He is buried at Roisel Communal Cemetery Extension, Somme. He was awarded the British War Medal and the Victory Medal. Information provided by the Long Long Trail website informs us that the 2/4th was a Territorial battalion which arrived in France in 1917, forming part of the 177th Brigade in the 59th Division (2nd North Midlands). The 59th was a Second Line division that had been posted to Ireland in 1916, then was posted to France where it first arrived on the 17th February 1917. It was reported that the Division was not considered properly trained and did not have any opportunity to add to its training before it was thrown into the front line south of the Somme, near Estrees. In April 1917, the 59th took part of the pursuit of the German retreat to the Hindenburg Line. It suffered a major setback in the “bloody repulse” at Le Verguier, and was also attacked at Villeret and Hargicourt. Lt Col E.U. Bradbridge, author of “59th Division: 1915-1918”, commented that the division “was sent straight up to the front and put in the line south of the Somme, near Estrees, where it experienced its initiation into the mysteries of trench warfare, and gained lessons concerning mud, gas, crumps, and such like evils.” He adds that “The Division had not been long in the line when the Germans suddenly retired across the Somme (March 1917) and, of course, the British troops at once pushed forward in pursuit …” It seems that George Gale was killed somewhere in these prolonged and dangerous operations in pursuit of the German retreat. George Gale was buried in Roisel Communal Cemetery Extension, Somme (click to see the PDF copy of his CWGC Commemorative Certificate). 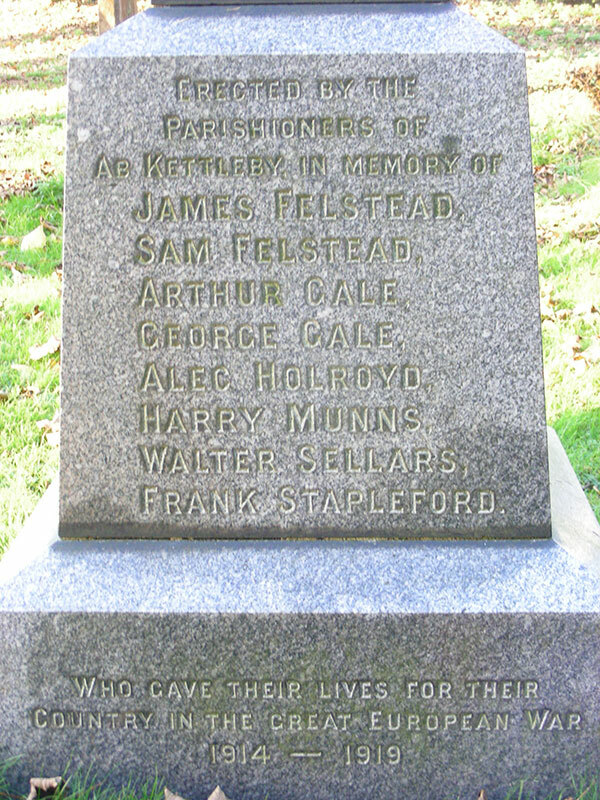 He is remembered on the War Memorial at Ab Kettleby, detail of which is provided by the Leicestershire War Memorials Project, where there is an excellent summary prepared by Mr Michael Doyle, curator of Their Name Liveth For Evermore: The Great War Roll of Honour for Leicestershire and Rutland, in which a letter sent to Private Gale’s parents is quoted, including the following brief description of the manner of his death, “At the time he was killed your son was on patrol with Sergt. Blake and two other men, and he was hit by a sniper, and I believe he died almost instantaneously“.